"The Festool 561287 Kapex KS 120 Sliding Compound Miter Saw is a top-of-the-line sliding compound micro saw. It’s a great tool. I currently have one and it works quite well. It's made from reinforced fiberglass, which is a strong, sturdy material. 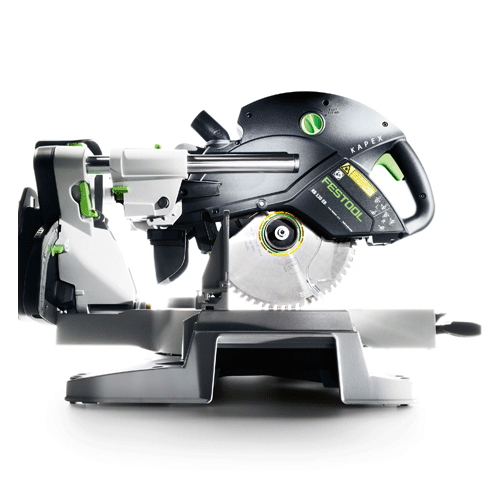 There are a couple of key features on the Festool Miter Saw that are very interesting. The Festool Miter Saw highlights a depth gauge on the back of the saw. With a simple flip of a switch, the depth gauge limits the intensity of the blade. So if you’re making certain cuts or need to adjust the depth of the blade, it can adjust itself easily. It also has a 47-degree bevel. While other saws do a 45-degree bevel, this saw goes to 47. Usually, there's a big knob on the back of an old-style bevel. It was a big wing nut, and you had to turn it. With this saw, you have a handle that's micro-adjustable. Another great feature is the saw has a dual laser on the left and right side of the blade. It also has a variable speed motor. So, if you're cutting certain materials (wood, brick, etc.) you can speed up and slow down your blade to make the cut. There's a guide on the side of the engine to let you know, based on what materials you're cutting, what speed to cut it at. The blade geometry on this is different than the standard 62-blade. The teeth are different sizes. It’s not a consistent tooth all the way around, it gives you a different pick, which provides you with a cleaner cut. It has a dual trigger to provide extra safety. There’s a button on the side of the saw if you push, you can’t turn the blade. It locks up the blade. So, if you’re someplace where there are children or if you want to for general safety purposes, you can just lock it up. Crown nested capacity: 6 5/8"
Cutting depth 90°/90°: 12" x 3 15/32"
Right 45°/45°: 8-15/32" x 1-3/8"